Carl Abrahamsson Working on Film on Kenneth Anger – Zero Equals Two! 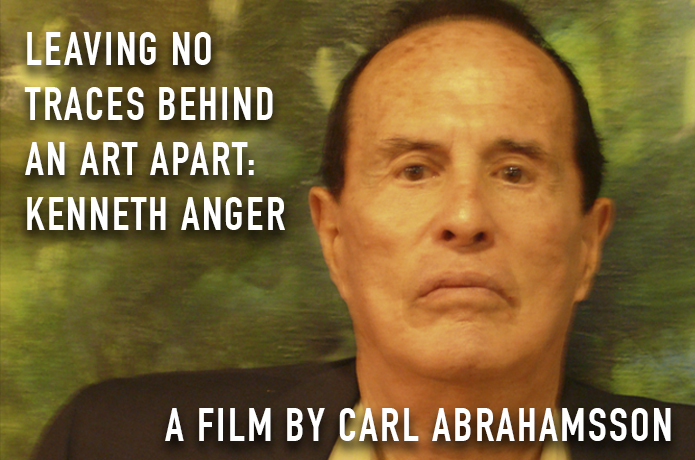 Noted occult author and lecturer Carl Abrahamsson has launched a campaign for the funding of a new film in the AN ART APART series: Leaving No Traces Behind – Kenneth Anger. “As an expansion of my work as a journalist (specialising in the arts and culture), in 2013 I started making documentary films about artists in a series I call “An Art Apart.” What inspires the people who inspire? What drives and motivates them? “So far, I’ve shot 15 films in this series, of which five are ready and released (please check out www.trapartfilm.com for more information). But ever since we met for the first time in Hollywood in 1989, Kenneth Anger has always been very special to me, and I’m overjoyed to work on this film now. With your help, I can wrap this film up exactly as I want it, and in that way also honor an artist who has never ever compromised! “I am in the process of acquiring some interesting archival material and am also beginning the post-production work (as all of my own material has already been shot): editing, sound-cleaning/mixing and grading. This is a costly affair unfortunately but it’s going to be worth every penny… Recent acquisitions (of rights to use clips from Anger’s films, for instance) have made the original budget explode (actually, several times over). I hope this crowdfunding campaign will set both past and future investments into balance. With your support, it will. “Kenneth Anger (b 1928) is a legendary filmmaker who has inspired several generations of artists within many different disciplines. With his extraordinarily beautiful films, Anger has woven a spell that continues to exert influence to this day. Often touching upon spheres of myth, magic and dreams, Anger’s cinematic expressions become myths, magic and dreams in themselves. This capacity for radiating inspirational force is also evident in his writing. His bestselling books ”Hollywood Babylon 1 & 2” have spawned an entertaining, provocative and sardonic way of writing that today permeates a lot of social media and the ”blogosphere.” Overall, Kenneth Anger is an American icon whose relentless integrity and artistic vision have helped shape American culture and cinematic discourse since the 1940s. “Leaving No Traces Behind is a film in the An Art Apart series. Candid interviews with Anger from the past decade are woven into a tapestry of impressions and expressions of Anger’s work. The result is a unique insight into the mind of a multifaceted artist with an unparalleled capacity to influence the world around him.